362 pages | 24 B/W Illus. Substantially restructured, updated, and additional case studies and student exercises. Coverage of how the field of Public HRM has been influenced by the two most recent national recessions, economic downturns at the state and local level, privatization and contracting trends at all levels of government, the growing presence of millennial employees in the workplace, issues surrounding social media use within the workplace, the evolving goals of social equity and diversity, and the shifting role and influence of labor unions. Discussions of how the growth in information technology capabilities has influenced the major processes within HRM, from workforce analysis through big data analytics to the explosion in automated recruitment, assessment, and instructional technologies. For the first time, the text includes an online Instructor's Manual, PowerPoint slides, discussion questions, and suggestions for further reading to make it even easier to assign and use this classic text in the classroom. 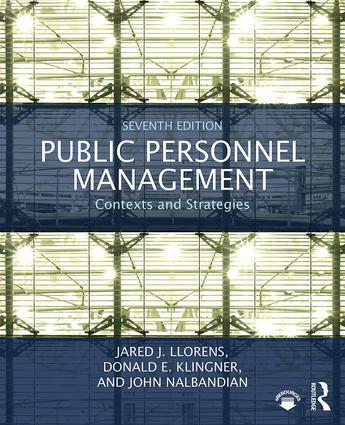 Providing the most up-to-date and thorough overview of the history and practice of public human resource management for both undergraduate and graduate students, Public Personnel Management, 7e remains the beloved text it ever was, ideal for introductory courses in Public Personnel Management, Public Human Resource Management, and Nonprofit Personnel Management. "This new edition conveys the importance of a strategic approach to public human resource management as a critical element of a sustainable policy system. It appeals to a new generation of public managers, who will work with an increasingly diverse and multi-generational workforce, while navigating complex systems of multi-actor governance, the very success of which depends upon the effective management of human capital." "The latest edition of this classic text offers a fresh perspective on enduring themes. Public Personnel Management maintains the focus of earlier editions, while including updated information on contemporary issues like social media and generational shifts. The expertise that these three academic leaders bring to this topic is evident throughout. Their robust treatment of personnel management makes this book required reading for students and practitioners of public administration." "The substantially revised 7th edition of Public Personnel Management continues to stand as THE definitive text for students, practitioners, and scholars interested in public sector human resource management. Novices will discover the book is both accessible and easy to comprehend while seasoned practitioners and scholars will find it advances a meticulously crafted, cogent framework that aptly characterizes public sector human resource management. Without a doubt, Llorens, Klingner, and Nalbandian’s book is a must read for any serious student of the topic." Jared J. Llorens is Director and Associate Professor of the Public Administration Institute in the E. J. Ourso College of Business at Louisiana State University, USA. Donald E. Klingner is Distinguished Professor and Director of the Master's in Public Administration program in the School of Public Affairs at the University of Colorado-Colorado Springs, USA. John Nalbandian is Professor Emeritus in the School of Public Affairs and Administration (SPAA) at the University of Kansas and Visiting Professor of Practice at Virginia Tech University, USA.